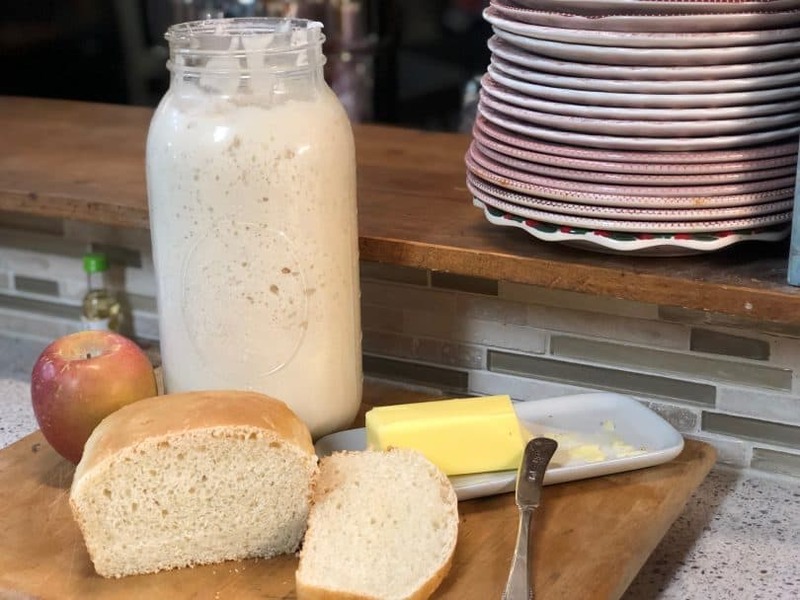 I have a sourdough starter that I can rely on and recipes that are out of this world for a carb lover like me. How did I arrive at this point of warm bread bliss? I started using a new sourdough starter that was dehydrated. That’s right. When the packet arrived from Alderman Farms, it looked like a bag of cracker crumbs. In the past, I have tried other starters that I loved , and other starters that I found hard to care about. I have gathered many good bread recipes that have helped us give up buying bread. Once you find something that works easily for you, giving up grocery store bread becomes an attainable reality. I highly recommend this book for great information on baking bread of all kinds. This was different than any other approach I had previously tried with sourdough starter. I read the instructions a few times to be sure I was ready to begin. The process seemed clear and straight forward although it was different than other methods I had used in the past. One difference was the use of milk instead of water. I used a half gallon glass jar to begin my starter and have been happy with that choice. Cover the jar and developing starter with a paper towel or muslin cloth. You do not want the jar to be air tight. Most San Francisco Sourdough starters use only water and flour. I went forward as the directions stated, understanding that this was not a San Francisco Sourdough Starter but a different variation. In the end, I would be glad I let go and stepped out in faith. 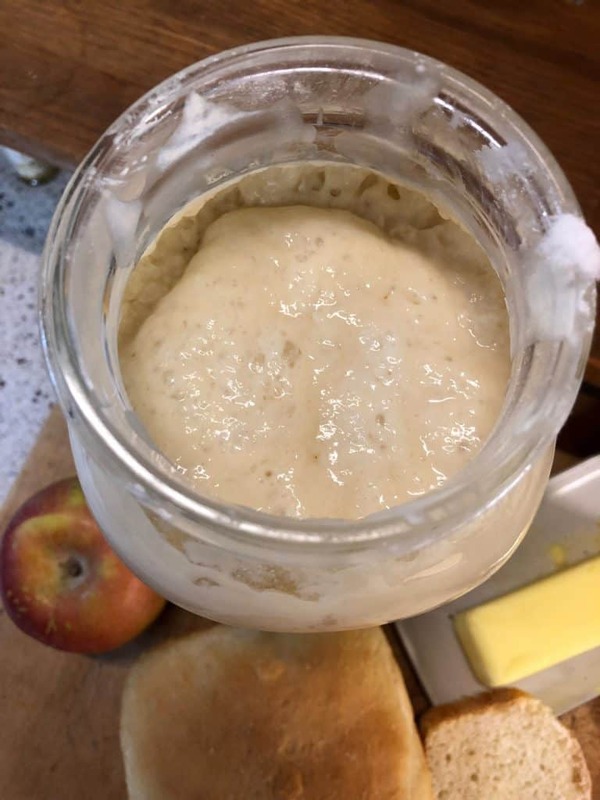 My sourdough starter picked up steam pretty quickly and before I knew it, days had passed and I had an active sourdough starter. I appreciated the process because up until this point, no starter had to be discarded. This was something that always bugged me about other sourdough starter instructions. Unless you wanted biscuits or pancakes, some starter needed to be discarded in order to keep adding to the jar. Up to this point, I did not have to toss out any starter. It was time to bake my first loaves with my new starter. I chose the basic bread recipe to begin. Soon I was baking bread a few times a week and the freezer and my family were getting full! Update! Use Code TIMBERCREEK for $5 off, when you order Sourdough Start to Finish e-book from Alderman Farms! I use King Arthur all purpose flour for our baking. I trust this company and honestly I have no desire to mill my own flour. Baking our breads is a huge step for me and I don’t want to make it unattainable by adding more tasks to the process. Some websites will insist that you need to use a whole wheat or whole grain flour to get the starter activated. I have not found this to be true. 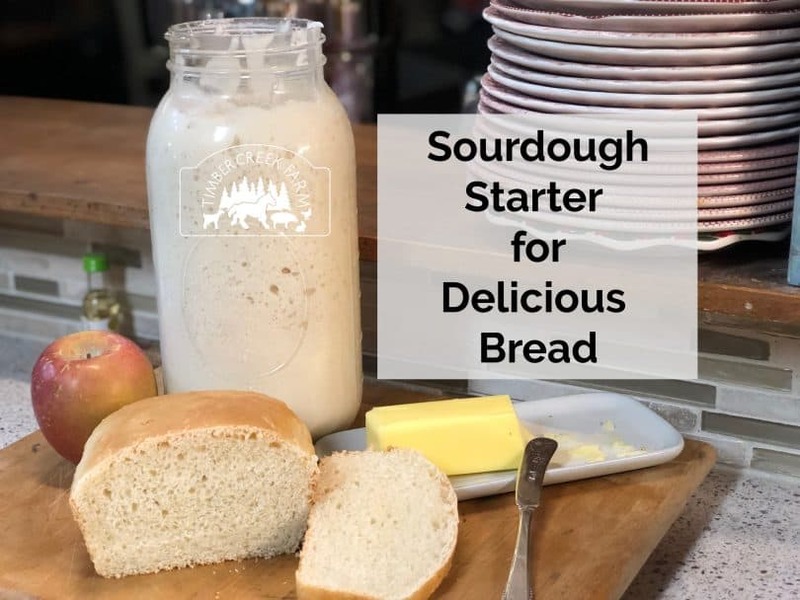 In addition to the recipes sold separately, with the sourdough starter purchase, I have used the starter in other bread recipes with great success. A family favorite is a Sourdough Banana Bread. Really, it’s the best banana bread I have ever tasted. I hear people say that they love sourdough bread, but don’t want to keep the starter alive. I can’t tell you that it’s ok to forget about your starter. Left ignored on the kitchen counter, the starter will die. And you will have to start over. However, like any other habit, putting the care of the starter (really it takes 2 minutes) into your routine is not hard. Once your starter is active and hardy, you don’t need to feed it every day, either. I feed my sourdough starter about every other day. The bonus from caring for my starter is that it’s ready to go when I need to start a batch of dough. 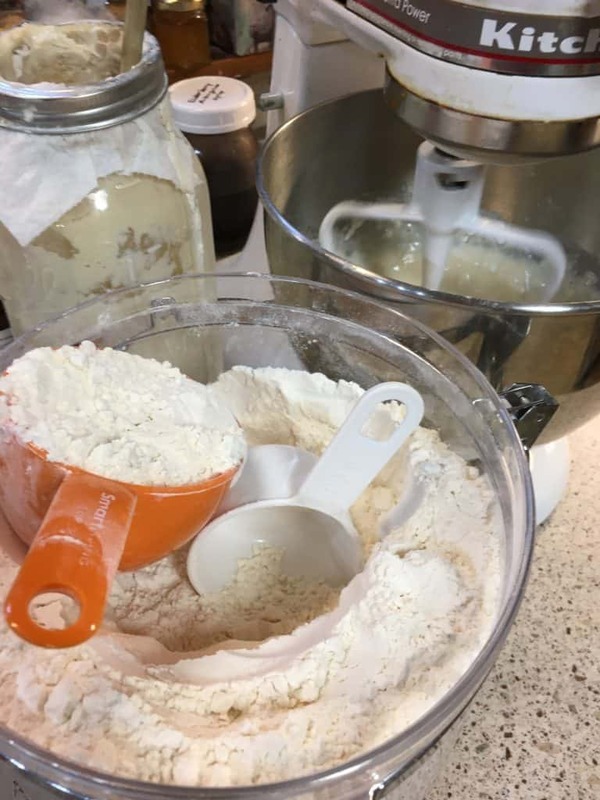 I have found that sourdough recipes are straightforward and use ingredients that are commonly kept in the pantry. Tossing everything together takes only a few moments. After I have the dough rising in the greased bowl, I go on with my day. Often I leave the bread to rise all day and separate it into loaves or rolls that night before going to bed. When I wake up, the bread is ready to bake. I wish I had used an egg wash on the loaves but I can assure you that the bread was good! Just kidding. You don’t need to take your starter on vacation. Parting is sad, but your starter will be waiting patiently for your return if you follow these easy steps. Feed the starter as usual, two days before leaving. Wait 24 hours. Cap the jar and place it in the refrigerator. When you return, remove it and let it warm slowly to room temperature. Feed the starter as usual, wait 24 hours before using, to allow it to fully reactivate. 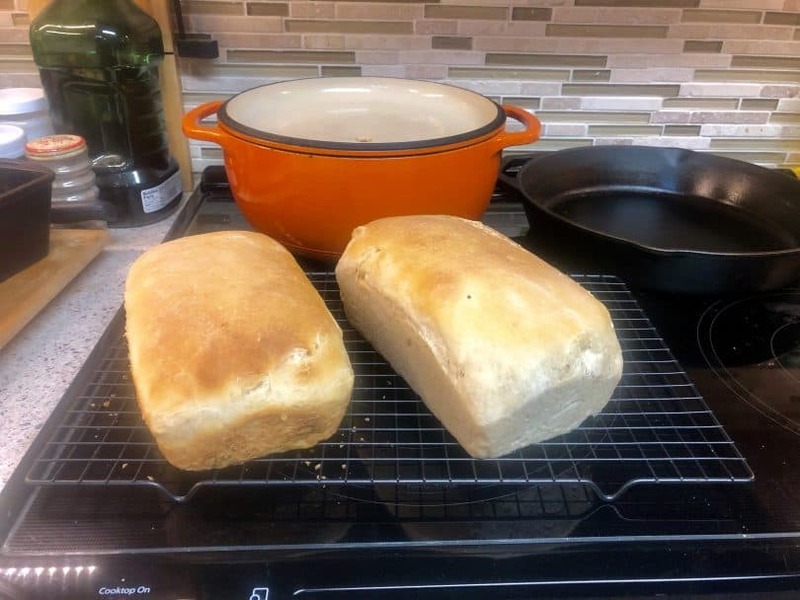 The most often used recipe in our house is the french bread recipe from Patti Alderman at Alderman Farms. It slices easily for toast or sandwiches, and can be made into rolls, sandwich style loaves or long baguettes. 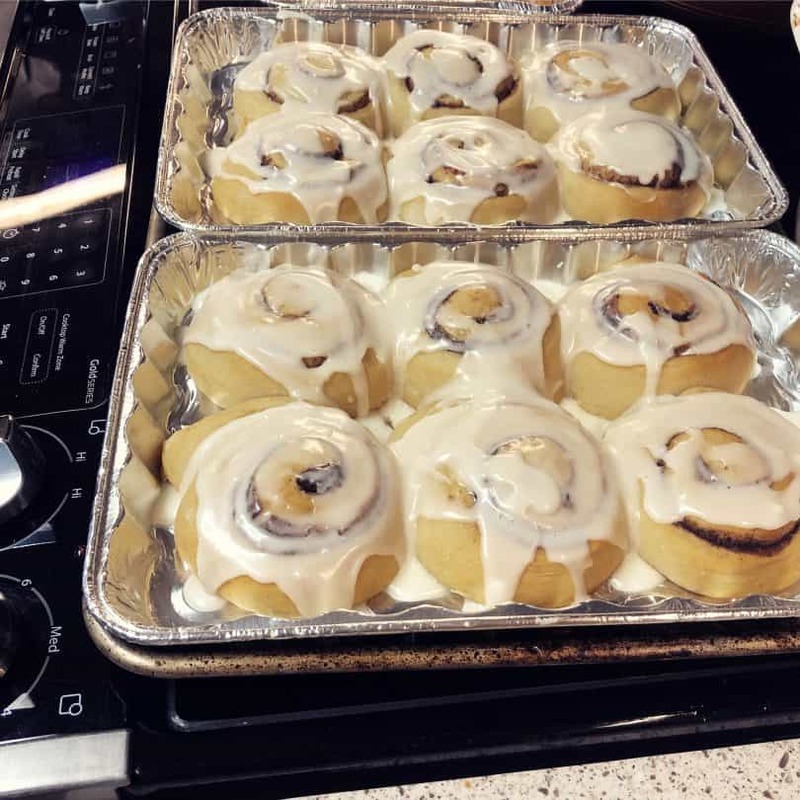 Full disclosure, the cinnamon roll recipe is addictive. You will end up filling yourself with all the butter cinnamon and sugar before good sense returns and you try another recipe. You have been warned. 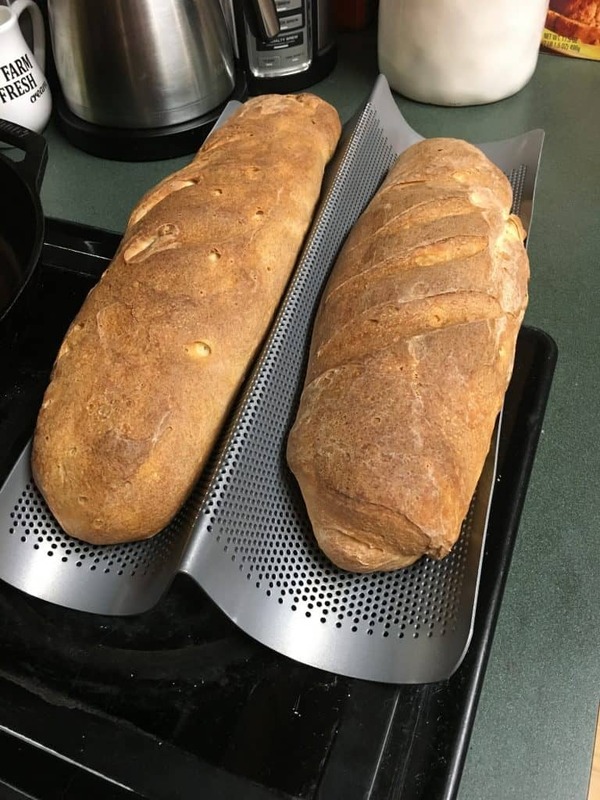 I prefer to use an 8 inch long loaf pan for this bread so the loaf is a little taller, but a 9 inch pan is perfectly fine to use. Add to bowl of electric mixer, and with flat beater attachment, mix in order listed. Add flour one cup at a time, until incorporated. 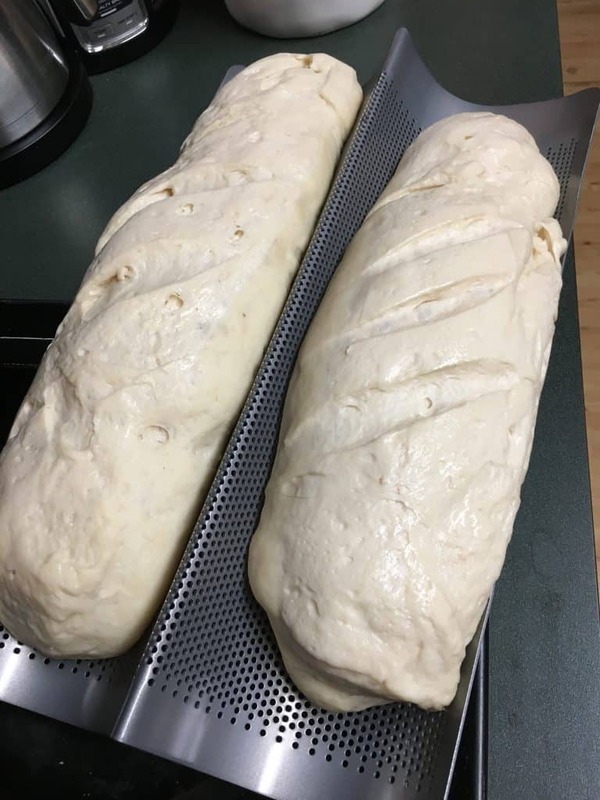 On a greased surface and with greased hands divide dough into two equal portions and roll into two long loaves. (or shape into loaf pans or roll shapes.) Place the long loaves on a greased baking sheet sprinkled with cornmeal. With a sharp knife, cut 4-5 shallow cuts down the loaf. Let rise about an hour until doubled. Alternatively, grease two loaf pans well. I use coconut oil. I have found that this recipe takes over 4 cups of flour. This may vary depending on your kitchen or area. As I stated above, I allow my bread to rise for a long time, not just the hour stated in the recipe. The temperature and humidity, in your home will affect how quickly the dough rises. When using loaf pans, allow the loaves to cool for a few minutes before removing from the pans. They should pop out easily. The next thing I want to try with the sourdough starter is incorporating it into the recipe for Easy No Rise Beer Bread. Stay tuned for more bread updates. 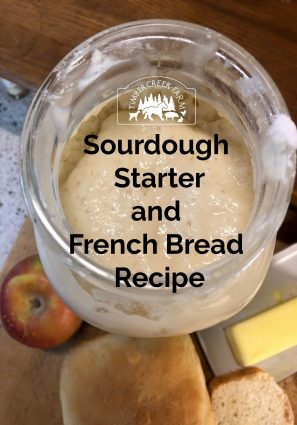 Need some French Bread but have no starter ready? Try this old tried and true recipe for French Bread. Don’t forget to stop by Alderman Farms for more sure to please recipes for breads and treats. Use Coupon code TIMBERCREEK for $5.00 off the regular price on the Sourdough Start to Finish e-book!